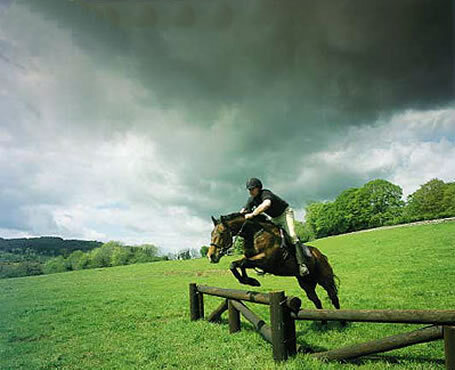 Our cross-country course offers something for everyone, it is an FEHL venue and Eventing Ireland Intro & Pre novice track while each fence offers an option to jump big or small or "not at all"!! Rustic fences, banks, drops, sunken road, natural water feature and purpose built water complex ensure countless options for every level of riding experience. Our two dedicated "play areas" are ideal for warming up and they offer a secure and safe area for the novice horse or nervous rider to train in. Built over 40 acres of parkland, forest and river, the course includes natural stone, log and bank fences that feature challenging water and newgrange complexes. Together with an inviting introductory play area consisting of 20 more novice rustic fences, this course provides plenty of options in a beautiful setting. Our scheduled cross - country events include FEHL (Future event horse league), Eventing Ireland one day event, cross - jump leagues (2 phase) and "Go as you please" days. Ravensdale Lodge Equestrian and Trekking Centre is the perfect place for pony and riding clubs to train and school horses & ponies for upcoming equestrian competitions and events. Train with qualified instructors in all disciplines (dressage, showjumping, cross country) or gather for a day of relaxed trail riding together in nearby forest or mountain routes. Great deals & offers available for riding and Pony Clubs. Two superb indoor arenas (65m x 40m & 40m x 25m) with waxed fibre sand surface. Coffee shop, meeting rooms, toilet, shower & changing facilities. Floodlit outdoor all weather sand arena (60m x 40m). Main all weather grass arena 140m x 90m. Second all weather grass arena 90m x 70m. Smaller all weather all weather grass warm up arena. Cross - country course (detailed above). Two secure cross - country "play areas" (detailed above). Three full sets of show jumps including Caro Grand Prix course & water trays. Two sets of professional timing equiptment including FEI approved TAG Heuer system. It is planned to redevelope and enlarge our floodlit outdoor all weather sand arena in 2011 to provide a new 90m x 40m arena with new all weather surface. Contact us for enquiries or to book a great day!